LAKE FOREST, CA (ANS – December 2, 2016) — For several years, while working for the British tabloids, one of my responsibilities was to “ghost” the stories of personalities who had powerful stories to tell, and so I would go to their home or hotel room, interview them, and then write up “their” story, which would be published in the next edition of the paper. I remember, back in August 1977, going to the luxury home of movie star, Diana Doors, who at the time was known as Britain’s Marilyn Monroe, and interviewing her about her claim to have had an affair with Elvis Presley, and then quickly ghosting a two-part series that ran in newspapers all over the world. I also wrote up the story British comedy star, Eric Morecambe — of Morecambe and Wise fame — who had just suffered a heart attack, which for him was no laughing matter, but he was happy that my paper was willing to pay him for the story. The interview got off to a bad start when I asked him how he had felt during the heart attack, and he replied, “It was wonderful. I enjoyed every moment of it.” Eventually, he began to soften up and cooperate and he then told me that he was afraid of death, but he had received many letters from Christians who said they were praying for him, and that had encouraged him. There were many more that followed in quick succession, including Barbara Windsor, a bubbly English actress, known for her appearances in the “Carry On” films and for playing Peggy Mitchell in the BBC One soap opera “EastEnders.” There were other British personalities who wouldn’t be so well known in the US, that I worked with on their stories. But my latest subject was completely different, as it told the story of the most famous woman in history – Mary, the beloved mother of Jesus. It all began when Larry Nelson, a friend, called me one day to suggest that I might like to consider doing the story of Jesus through the eyes of Mary, His magnificent mother. Neither of us at the time had actually seen a book written in this way, and so I agreed to take on my most challenging writing task and over several months, I literally “became” Mary. Now, having never met Mary, I had to ask the Lord to give me special skills to “tell” her amazing story, as I needed real insights into her life with her beloved son, Jesus, from his childhood, his growing years, his ministry, his terrible death upon the cross, which she witnessed, his resurrection, and finally, his ascension to sit at the right hand of his father in heaven. I began by imagining what it must have been like for this young and poor girl in love, living in Nazareth, looking forward to marriage, when suddenly her life is changed forever when she is told by an angel that she is to become the mother of the greatest person in history, the Messiah, Jesus Christ, and yet she is still a virgin. As I began my research and then putting the story together, which, by the way, is based on 365 Bible Scriptures, I envisaged the shock this young unmarried virgin from Nazareth must have experienced when she was told by the angel that she would bear the Savior of the world. I imagined how she would convey the news to her parents and Joseph, the man she was in love with. I wondered how would the people in her village would react when they eventually noticed that she was pregnant? Would they even kill her? As my fingers flew across the keyboard of my laptop, I was transported back in time to that dangerous period for Jewish people with the Roman occupation, and then how Joseph accepted her and they eventually went to Bethlehem, only to find that there was no room in the inn, and so they had to stay in a smelly stable with the animals and where she gave birth to the baby Jesus. The story then developed with the family escaping to Egypt from the cruel and jealous King Herod, and how, after Herod’s death, they went to Nazareth, where her brilliant son helped his father in his carpenter’s shop, and made quite an impression on the local Jewish leaders with his already deep understanding of the Scriptures. I felt Mary’s pain, when Jesus finally left home, after being baptized by John the Baptist in the Jordan River, and began his earthly ministry. For long periods, I realized that she would not see her son. To make matters worse, her husband Joseph had died and she tried to cope with the nagging loneliness of being alone in the world. I had to fight back the tears, as I later “joined” Mary near the end of the story, when she watched her son staggering in agony through the streets of Jerusalem with the cross on which he would die. I “joined” her at Calvary as she watched in horror as he nailed to the cross, and later when she went to the place he was buried and discovered that the stone at the entrance of the tomb had been rolled away. His ascension soon followed, and Mary was back in her home, with the knowledge that her son’s ministry on earth had ended and he was now seated at the right hand of his Heavenly Father in Heaven. 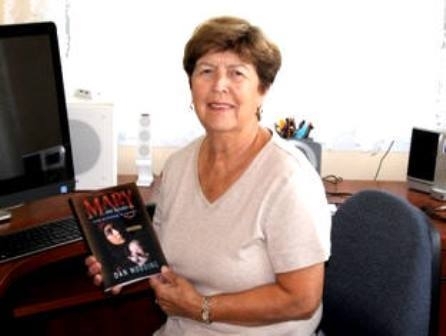 I’ve called the book, “Mary: My Story from Bethlehem to Calvary,” (Tanswell Books) and you can find out more about it by going to http://marythebook.com/, and now it is available, and it could make an excellent Christmas gift to give to a family member or a close friend who doesn’t go to church, read the Bible, but enjoys a good novel. You also could enjoy being transported back to those incredible days. Already, several well-known personalities have come forward with endorsements for the book, which has received high ratings on www.Amazon.com, where you can also purchase a copy. My hope is that this book will inspire many, particularly young women, who will identify with Mary, and I believe it will be a wonderful way of getting inside the mind of the cherished mother of Jesus. It was certainly a great privilege to “become” Mary, the mother of the greatest person in history, Jesus Christ. Again, to find out more, or to order a copy (for yourself) or as a Christmas gift, just go to: http://marythebook.com/. There you can read all of the endorsements and also watch a video made by my son, Peter Wooding, about why I wrote the novel. Photo captions: 1) Book cover designed by John Shaffer. 2) Actress, Diana Dors. 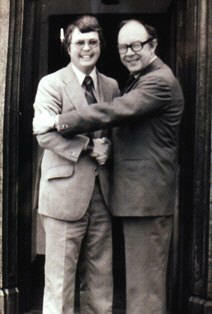 3) Dan with Eric Morecambe. 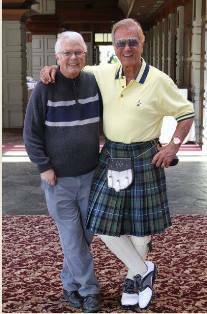 4) Dan Wooding with Pat Boone, who is wearing a kilt at a golf tournament. 5) Roma Downey as Mary in the “Son of God” movie. 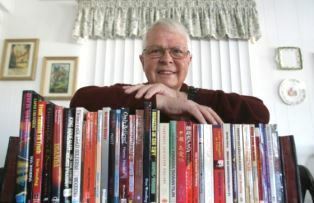 6) Dan Wooding with some of his 45 books (OC Register). About the writer: Dan Wooding, 75, is an award-winning winning author, broadcaster and journalist who was born in Nigeria, West Africa, of British missionary parents, Alfred and Anne Wooding, who then worked with the Sudan Interior Mission, now known as SIM. He now lives in Southern California with his wife Norma, to whom he has been married for some 53 years. They have two sons, Andrew and Peter, and six grandchildren who all live in the UK. Dan is the founder/president of the ASSIST News Service (ANS), and is also the author of some 45 books. He has a weekly radio show, Front Page Radio, on the KWVE Radio Network (www.kwve.com), and two TV shows, Windows on the World — with Garry Ansdell, and Inside Hollywood with Dan Wooding, which are both carried on the Holy Spirit Broadcasting Network (http://hsbn.tv). You can write to Dan Wooding at assistnews@aol.com. ** You may republish this or any of our ANS stories with attribution to the ASSIST News Service (www.assistnews.net). Please tell your friends and colleagues that they can receive a complimentary subscription to ANS by going to the above website and signing up there.